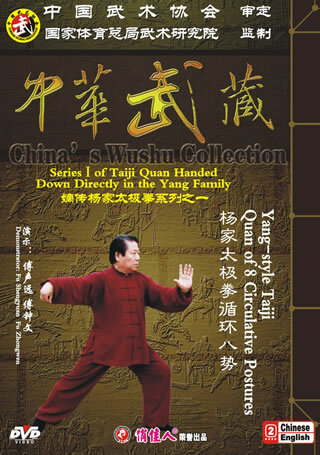 8 Postures of Yang-style Taiji Quan is also called 8 Postures of Circulative Taiji Quan. It is created by teacher Fu Sheng-yuan for the beginners and the persons who lack time to study it. 8 Postures Taiji Quan as its name suggests that it has 8 postures. The set routine is short and there are few movements. Easy to study, it makes beginners experience as soon as possible that taijiquan's movements are incessant and one posture runs through another one. The main point of the movement is natural and smooth, the advantage of this set routine is that the conversion and joining are ingenious. It is incessant and circulative from the starting form to the left brushing aside the knee and inverse stance. You can practice it once or for times in a circular way. Only if the body feels good you can practice it more times.